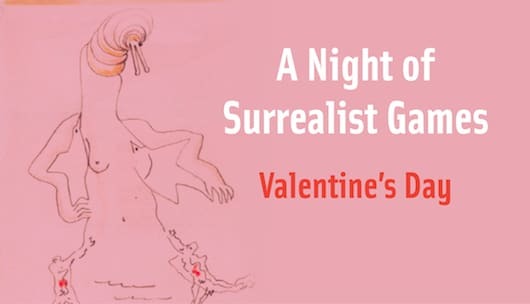 Roger Clark Miller (Mission of Burma, Alloy Orchestra) will host an evening of drawing and word games that were developed during the heyday of surrealism. Games include the Exquisite Corpse drawing game (advanced drawing skills not required! ), the Dream Game (a board game where you end up creating a dream! ), and many varieties of surrealist word games. The consummate master of ceremonies, Miller will not only explain and lead the games to kick off the event, but he’ll also DJ – providing a surrealistic soundtrack to the evening. (Paper and drawing/writing tools will be supplied). Everyone plays while taking in a surrealistic soundtrack curated by Miller, and sipping cocktails made especially for the evening. Image above: André Masson, Max Ernst, and Max Morise, Exquisite Corpse, 1927. Arrive anytime in your most whimsical attire.